This score is used to predict outcomes following single or repeat LINAC (Linear Accelerator) radiosurgery in AVM. Raffa, Scott J. et al. “Validation Of The Radiosurgery-Based Arteriovenous Malformation Score In A Large Linear Accelerator Radiosurgery Experience”. Journal of Neurosurgery 111.4 (2009): 832-839. Web. Anti-NMDA receptor encephalitis is an immune-mediated syndrome predominantly seen in young females. Symptoms include psychiatric changes, autonomic dysfunction and other neurologic findings. It is commonly associated with mature ovarian teratomas. There is a need for increased awareness and diagnostic suspicion for anti-NMDA encephalitis in patients with suspected encephalitis of unknown etiology. Early intervention significantly affects outcome. Treatment for this condition includes supportive care, considering surgical resection when appropriate and immune-modulating therapies. This algorithm was taken from an abstract presented at the SCCM 45th Critical Care Congress by McLatchy, et al of Hofstra Northwell School of Medicine. Abstract. Anti-N-methyl-D-aspartate Receptor Encephalitis: An underrecognized, Treatable Disease. McLatchy, J. et al. SCCM 2016 45th Critical Care Congress. February 19-24, 2016, Orlando, Florida. New recommendations for sepsis was published in the February 2016 issue of JAMA and highlighted at SCCMs 45th Critical Care Congress in Orlando, Florida. Sepsis is defined as life-threatening organ dysfunction due to a dysregulated host response to infection. Septic shock is defined as a subset of sepsis in which profound circulatory, cellular and metabolic abnormalities substantially increase mortality. The new definitions were suggested to reflect the advances made in the pathophysiology, management and epidemiology of sepsis. The term “severe sepsis” has been removed to highlight the fact that sepsis, by itself, is already a severe condition, making the term severe sepsis redundant. Organ dysfunction is a key part in the definition of sepsis, and it is the main consideration that elevates uncomplicated infection to sepsis. Suspicion of infection should prompt a search for organ dysfunction, and organ dysfunction should prompt a search for a focus of infection. A new diagnostic tool, quickSOFA or qSOFA, was recommended, which consists of 3 simple bedside tests to identify patients at risk for sepsis. This tool directs physicians to look for these signs: a change in mental status, decrease in SBP <100mm Hg or a respiratory rate >22/min. Patients with 2 or more of these conditions are at higher risk of prolonged ICU stay or to die in the hospital. For these patients, clinicians should investigate further for organ dysfunction, initiate or escalate therapy, and consider referral to critical care or increase frequency of monitoring. The task force identified two new clinical criteria that should be used in diagnosing septic shock: persistent hypotension requiring vasopressors to maintain MAP>/=65mmHg and blood lactate >2mmol/L despite adequate volume resuscitation. 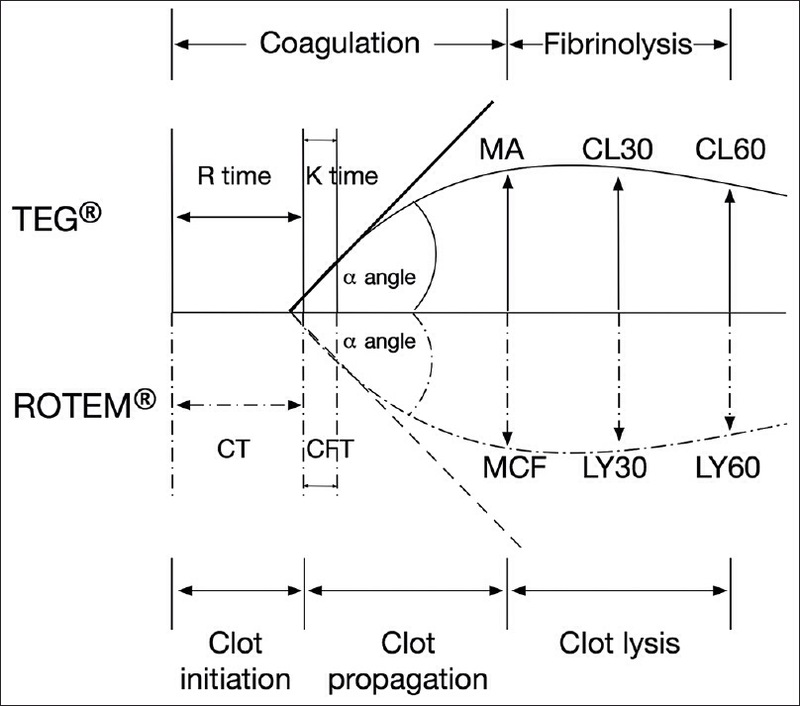 Both TEG and ROTEM are methods of measuring coagulation and fibrinolysis. In TEG, the “cup” of the machine rotates, whereas in ROTEM, it is the sensor shaft that rotates. 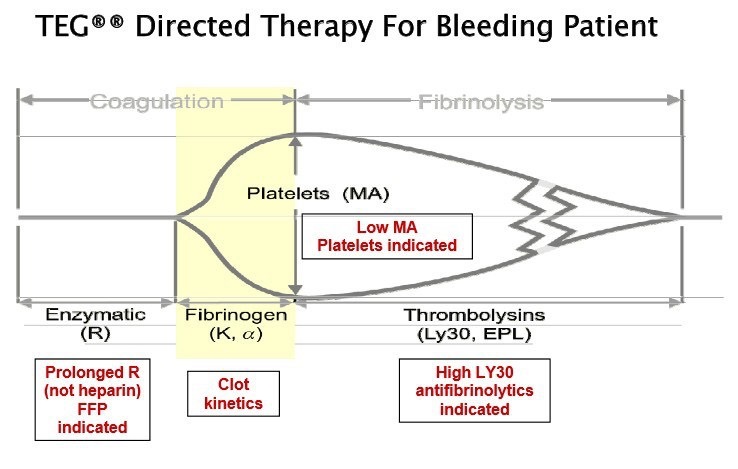 In thromboelastography, blood is rotated by 4`45″ 6x per minute to simulate sluggish blood flobe. A wire probe is then used to measure the speed of coagulation and extent of fibrinolysis. 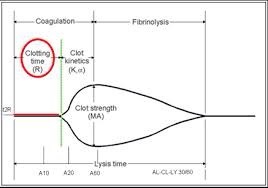 Thromboelastography measures 4 parameters of blood coagulation (reaction time, K value, alpha angle and maximum amplitude) and 2 parameters of clot lysis (estimated percentage of lysis and percent clot lysed after 30 minutes). Two other values are calculated based on a proprietary formula from the company who created the machine (coagulation index). 2. Cup oscillates around submerged torsion pin which is connected to a computer. 3. As coagulation occurs, pin adheres to clot and begins to move with it. 4. Magnitude of pin motion directly proportional to strength of the clot. Pin motion is displayed graphically by the computer. Torsion pin remains motionless until clotting begins. 5. Amplitude decreases as fibrinolysis begins and the pin begins to slip. 6. Graph analyzed and 5 parameters are measured. 1. R – time elapsed until first measurable clot forms. Impacted by coagulation factors. 4. MA – highest vertical amplitude of TEG tracing. Impacted by platelets. 5. LY30 – percentage of amplitude reduction 30 minutes after maximum. Measures fibrinolysis. R normal range is 5-10 minutes. Elevation represents deficient clotting factors and is treated with FFP. K normal range is 1-3 units. Elevation represents deficient fibrinogen and is treated with cryoprecipitate. Alpha angle normal is 53-72 degrees. A low value represents deficient fibrinogen and is treated with cryoprecipitate. MA normal range is 50-70 mm. 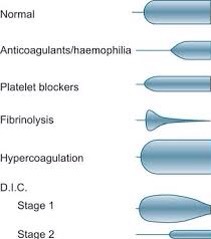 A low value represents deficient platelets and is treated with platelets. LY30 normal range is 0-8%. A higher value indicates excess fibrinolysis and is treated with antifibrionlytics s.a. aminocaproic acid. YouTube. (2018). 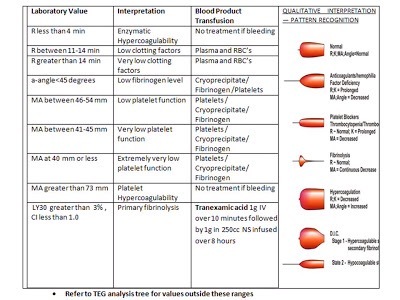 Thromboelastography. [online] Available at: https://www.youtube.com/watch?v=SjH05uGSGv0 [Accessed 2 Apr. 2018]. 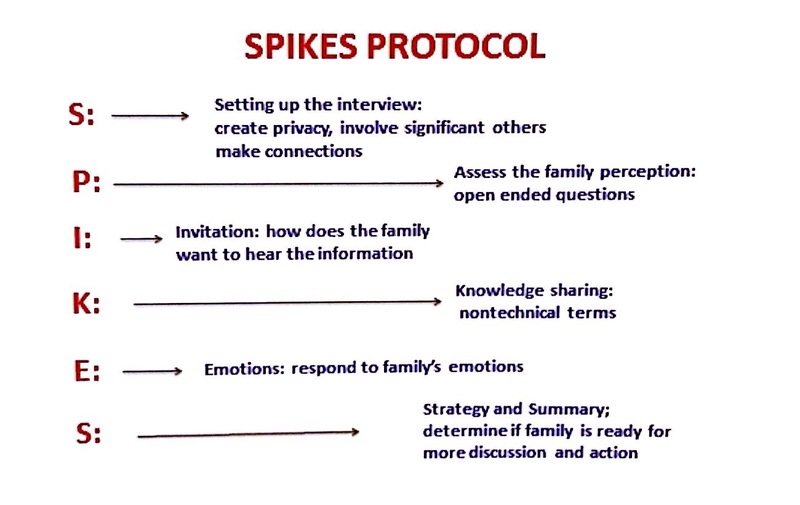 SPIKES is the acronym used for a protocol used in goals of care discussions.